2. Can updates on comfort mode, brick an ECU (or more) ? – As long as you stick to the proposed measures plan in Comfort Mode and your setup (laptop, software etc.) is solid, there shouldn’t be any opportunity to brick an ECU. 3. If updates are safe, on what series can i do them ? F, G for sure..can i do E ? F, G and I series and for Motorrad models with vehicle electrical system 2020 (BN2020). E Series programming is not supported in ISTA+, use ISTA/P or WinKFP for individual modules. 4. Updates for Navi maps, can I do them in ISTA also ? Again, is it safe ? Do you recommend E-Sys more for this job ? – I have not attempted this with ISTA+, but would assume process is similar to ISTA/P. I’d stick with ESYS strictly for ease of use. 5. What aftermarket power supply do you recommend for programming, coding(to use with car) ? From what i read, for E-series without Efficient Dynamics must be around 40A, and must not go over 14.2v, while for E-series/F-series with Efficient Dynamics must be around 80A, and must not go over 14.8v. Is this correct ? If so, is there a power supply that can fit both situations ? I did some research about this, but i think it is an important issue and must be correctly addressed, so I would trust more an answer from you guys. Is Mean Well SE-1000-15 ok for both situations ? – Schumacher 700A should fit all requirements. While there are many recommendations, unless you’re 100% comfortable modifying a Power Supply to use with the cars, I wouldn’t do it. If you do, Google”Server Power Supply Conversion” and you’ll get a lot of information. 6. I have an BMW ICOM A2 with ISTA. I understand that E-Sys is more complex than ISTA, regarding coding and programming for F-Series, as NCSExpert and WINkfp are for E-Series. You can do codingin ISTA also right ? for all series ? Or ISTA does less ? – You need to differentiate between coding and “encoding”. ISTA+ will do “encoding” depending on the programming required. That is not the same as coding (features). I don’t think I’d say ESYS is more complicated than ISTA+, each are different in the way they approach coding/programming. Interface B – diagnostic via MOST bus, and have connection to A-interface via USB connection. Interface C – 20-pin cable for old models. The modified ICOM A2 for vehicles with OBD access receives a significantly more powerful processor and more storage capacity.Robust aluminium case will help to avoid damage when using in harsh environments. To protect the MOST connector, the ICOM B for vehicles with optical MOST access will be equipped with a soft cover made of rubber instead of the former plastic cap. The ICOM C for old series with a diagnostics socket will be additionally equipped with an approx. 20 cm long cable, which facilitates the connection of the ICOM A2 and makes storage in the engine compartment easier. B – diagnostic via most bus, and have connection to A-interface via USB connection. C – 20-pin cable for old models. The modified for ICOM A2 for vehicles with OBD a ccess receives a significantly more powerful processor and more storage capacity.Robust aluminium case will help to avoid damage when using in harsh environments. To protect the most connector, the for BMW Diagnostic Tool ICOM B for vehicles with optical most access will be equipped with a soft cover made of rubber instead of the former plastic cap. 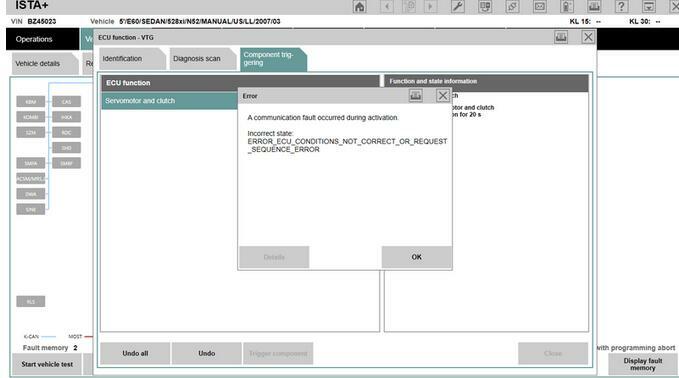 This blog list 3 kinds of bmw diagnostic scanner ISTA errors and solutions you may need. Note: All error solutions here are suitable for BMW ICOM A2 and BMW ICOM Next! Solution: Try setting COM port latency to 1 in Advanced Settings for the port. You should change it to 1 to have the least lag/disturbances between data transfer. 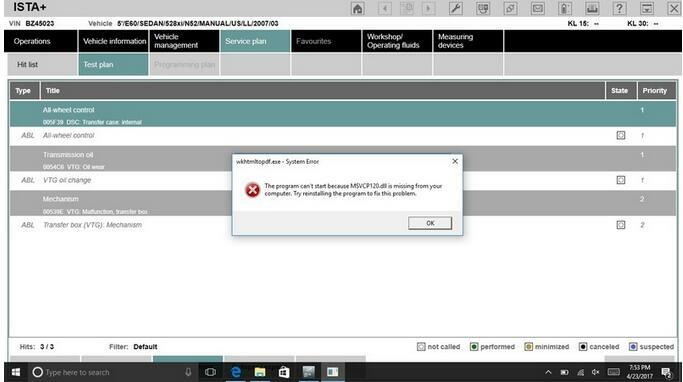 The program can’t start because MSVCP120.dll is missing from your computer. Solution: Reinstall VC++ Redistributables and try again. If you’re running x64, you will need both x86 and x64 bit versions installed. Feedback: I got rid of this .dll error by installing an older version of VC++. Solution 1: I changed my com port to port 1 and it worked. It’s worth a shot, easy to change back if it doesn’t work. Solution 2: Uncheck the Ethernet box and BMW ICOM A2+B+C ISTA-D worked. Feedback: I changed COM9 to COM1. Its working! This WinKFP job was done with BMW ICOM A2 emulator for FRM3 flash after FRM3 repair/reflash by Xprog-m or other programmer the like. After FRM3 was repaired, then need to flash the correct software in FRM3 module. The flash can be done with WinKFP, and in 2 ways. Comfort mode and develop mode! The develop flash mode you need when the BMW ICOM Software repair dump not exactly belongs to car, and because safety reasons winkfp not leaves to update! In that case You need to use winkfp develop mode, which allows to be flashed any kind of software in any module! First of all need to update winkfp spdaten. 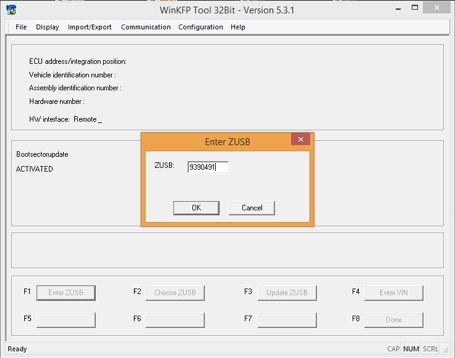 After spdaten is updated , then open the WinKFP and choose comfort mode and enter ZUSB (bmw zb, part number), will pop up one window where u will see the choosed zb number, accept it! 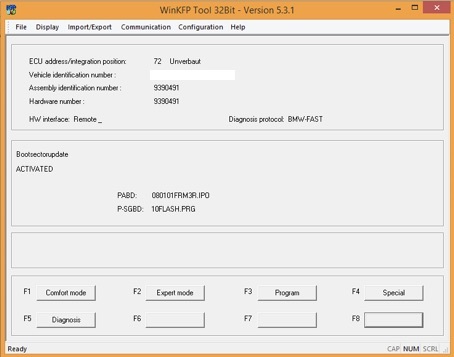 When You updating with winkfp, then need to enter the LONG vin number! Now you can start programming! If you getting error , to can`t update because software incompatibility, then need to do by Develop/Expert mode! In that case note down the details like in pic 4.
click on expert mode and choose manually all data what u noted down,and the coresponding zb number also! Now You can start to flash with expert mode! 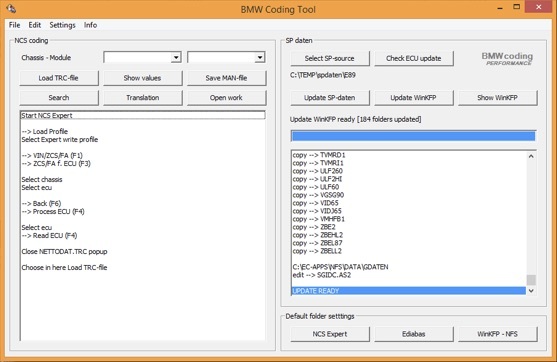 BMW Coding Tool Winkfp also have more functions like diagnostic , check aif and so on! 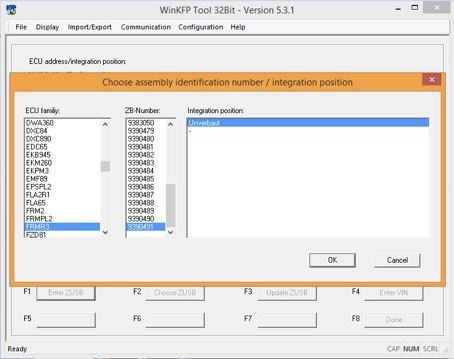 If you like to change vin number in any unit, the winkfp is the easiest way! After finished the flashing, need to recode with NCS expert! 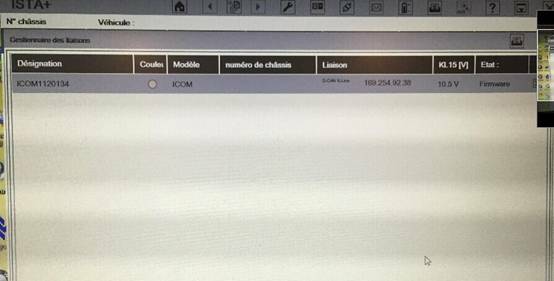 BMW ICOM A3 Program ok but diagnose with no luck, device fail to connect. How to do? The hardware version is too low to do diagnostic job. What ICOM hardware APPLICATION 1.40.05 and SYSTEM version 01.25.02 is compatible with? 1.Please use internet cable to connect ICOM (including all available ICOM) with computer, and plug 12V power adapter to super ICOM A2 to supply power or connect ICOM to BMW vehicle for power. 2.Unzip perfect ICOM A1 A2 fw 1.40.05 upgrade files. 2) Common version ICOM A2 A1: browse http://169.254.92.38:60080/ and username/password: root/NZY11502. Following picture is perfect version ICOM A fw 1.40.0/ 01.25.02 login inform. For the following operation procedure, both common BMW ICOM Next and super version ICOM are the same. 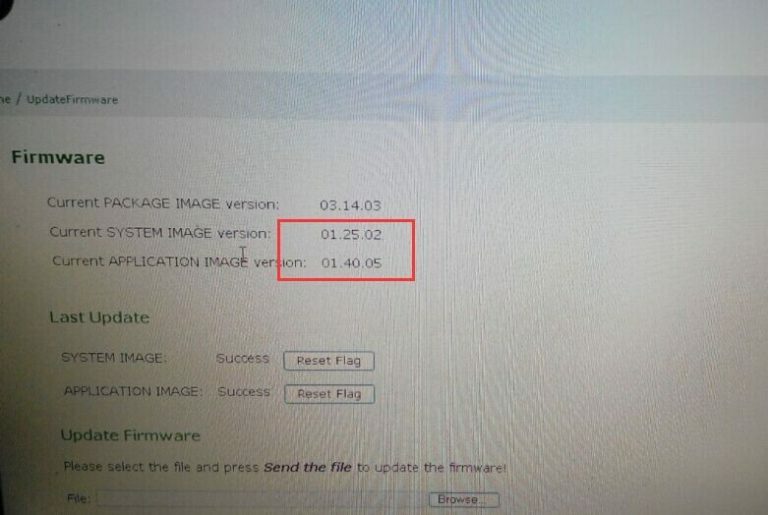 3）Click “Update Firmware”, you will see ICOM firmware version information. 4）Click “Browse” to select file “ICOM-BootImage-01-25-02.bin”, set image type as “SYSTEM”, click “Send the file”. 5）When you get message “Write the image file to the flash?” click “Yes”, then ICOM indicator light will turn red. 6）When you get message “The SYSTEM IMAGE update was successful”, click “Update Firmware”. 7）Choose ” ICOM-ApplicationImage-01-40-05.bin”, set image type as “APPLICATION”, click “Send the file”, it will cost several minutes please be patient to upload. 8）When you get message “Write the image file to the flash?” click “Yes”, then the OBD-II scan tool ICOM indicator light will turn red for the second times. When it finish upgrading, click “reboot”. Please be sure your computer is to obtain IP address automatically. Learn it from an experienced technician. I consulted ICOM A2 from the professional technician mainly because I read much information in BMW forums telling that the only difference between ICOM A2 & ICOM is the hardware. Actually, ICOM A is the first generation bmw scanner. ICOM A is the basic component. In physical terms, it would provide the vehicle diagnostic interface OBD II interface, and provide adaptive integration to the repair shop network interfaces required. Voltage is provided by KL30 by vehicle interface. ICOM A requirement of the electrical operation of a minimum voltage of 8V. Only the supplied voltage exceeds the minimum limit in order to ensure a stable function. ICOM B is the external ICOM A MOST (Multimedia Transmission System) interface. It is connected with ICOM A through the USB cable. Voltage is provided by ICOM A through USB. Only when the lowest of the ICOM A supply voltage of 8V, ICOM B would only be ready to run the electrical side of the vehicle through a standard ICOM B MOST interface. 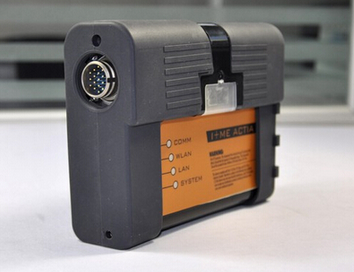 ICOM C is an intelligent interface that allows OBD II socket and BMW round match. As the lengthening of the auxiliary module, it will help to connect ICOM A and non-OBD II vehicle interface. Voltage is provided from the vehicle side of the circular socket by KL30 provided. ICOM C electrical operation provides for a minimum voltage of 8V. KL30 on the voltage sent to the OBD II device on the inside, and thus to Auto Scanner Tool ICOM A power supply. Only when the vehicle’s battery voltage exceeds the minimum limit in order to ensure stability of the two devices interact. Compared with ICOM A+B+C, BMW ICOM A2+B+C has the some special features. The modified ICOM A2 for vehicles with OBD access receives a significantly more powerful processor and more storage capacity. Robust aluminium case will help to avoid damage when using in harsh environments. To protect the MOST connector, the ICOM B for vehicles with optical MOST access will be equipped with a soft cover made of rubber instead of the former plastic cap. The ICOM C for old series with a diagnostics socket will be additionally equipped with an approx. 20 cm long cable, which facilitates the connection of the ICOM A2 and makes storage in the engine compartment easier. 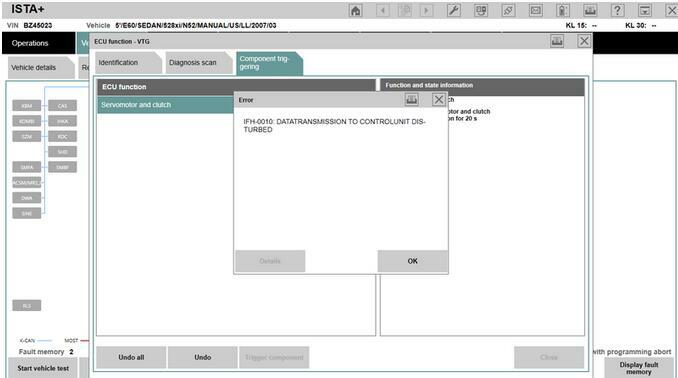 How to save ISTA-D BMW Diagnostic Operations and Tests? I have installed New BMW ICOM software ISTA-D (3.48) on my laptop. It works well and could read the error codes and perform tests. 1: Are these actually saved somewhere else and I could not find them? 2: If they were not saved, is there any setting change to be done is in ISTA-D so that these operations can be saved? Around the two questions I search answer on forums and I do find a solution which was surprisingly worked for me. Here I would like to share with you. Solution: You have to enable FASTA in ISTAGUI.exe.config file – see first key value set to true, leave everything else as is. This should enable Operations Logs in ISTA. Not 100% sure that this is the reason the operations report populates, but it never did before and also saves the progress of actions so that it can be started again (Once vehicle is ID’d, click on Finished). Try and see. To be successful in saving, I think you will need at least one action performed (either FUB or ABL, doesn’t really matter). Because its Standalone, the Transfer part of my ISTA will stay “In Progress” and doesn’t go anywhere. They’re saved in FASTAOut folder. To read them outside of ISTA you need OrderDataViewer. Some friends told me it seems that the newer Rheingold 3.56 can save the error codes and the Auto Scanner Tool. I find some information in this blog, hope it helps someone. 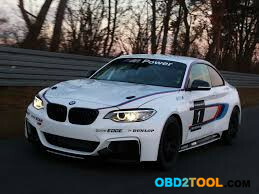 Days ago, I used the new ENET cable to manage to do some coding on BMW F22 M235i. Then, i share my coding adventure on forums. And here is one of useful feedback. Put them here and it works. “Finally had enough time off work to get all the software installed onto my laptop (over 7GB of files). Once installed I took my new E-SYS cable and connected to the OBD II port in the car. Note, if you haven’t found this connection yet it took me a while. My old E92 had a little plastic door right above the hood release, not on the F22. Everything being black I had to take a flashlight up under the driver side before I found it. No cover on it, just sits along the side kick panel above and back from the trunk release button. Not having all the software fully licensed for use yet I did some simple looking around and check to see if my car was supported with the default F20 file set. I was able to the read my cars VIN and populate all the internal settings in the software configuration. Really cool! I now have access to all the internal data settings stored in my ECU. Save a copy of the original settings (will back them up to be safe) and shutdown. Once i get the token files I will begin finding and coding the different settings. “You don’t need to be a computer software developer to install and use the software, but that won’t hurt either. The reason you are finding it difficult to find all the required information and setup in one location, as best I can tell, is that a lot of what is being done could be consider in violation of warranty and/or software rights. I think the people who have ventured into this are vary worried about being exposed to the powers to be, or worst held in some legal contempt for helping others change computer settings in someone else’s vehicle. This is the instruction on how to change vehicle order (VO) with NCS Expert, on BMW vehicles except F series. 1.In NCS Expert, load the Expertmode profile. 2.Press F1 or the VIN/ZCS/FA button. 3.Press F3 or the ZCS/FA f. ECU button. 4.In the Choose CHASSIS pop-up window, choose the E89 chassis and press the OK button. 5.In the Choose ECU pop-up window, choose the CAS ECU and press the OK button. 6.The model (CHASSIS), VIN number (FG), and VO (FA) should be displayed in NCS Expert. 7.Press F2 or the Enter FA button to modify the VO. 8.In the Choose CHASSIS pop-up window, choose the E89 chassis and press the OK button. 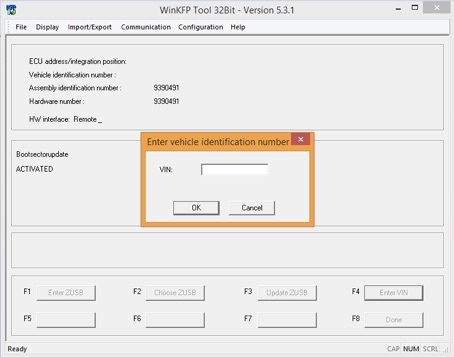 9.In the Enter VIN pop-up window, verify that the Vin listed is the correct VIN number for the vehicle. The last digit attached to the VIN number is a checksum. You should not have to change anything on this step. Just verify and press the OK button. 10.In the Enter FA pop-up screen, for the Attribute text field, input the SA or Service Code. After typing in the code, press the Add button, and verify that the code was listed in the list of FA codes. After verifying, press the OK button. 11.Press F6 or the Back button. 12.Press F4 or Process ECU button. 13.For the Choose ECU pop-up window, select CAS and press the OK button. 14.Press F2 or the Change job button. 15.From the Choose job pop-up window, select FA_WRITE and press the OK button. 16.Under “get coded:”, verify that CAS is the ECU selected to get coded. Also verify the JOBNAME is equal to FA_WRITE, and then press F3 or the Execute job button. 17.After the job has ended, we need to also write the new VO to the LMA ECU so that it will be both wrote to the CAS and LMA ECU. Press F1 or Change ECU button. 18.From the Choose ECU pop-up window, choose the BMW Engineer Software and press the OK button. 19.Under “get coded:”, verify that LMA is the ECU selected to get coded. Also verify the JOBNAME is equal to FA_WRITE, and then press F3 or the Execute job button. 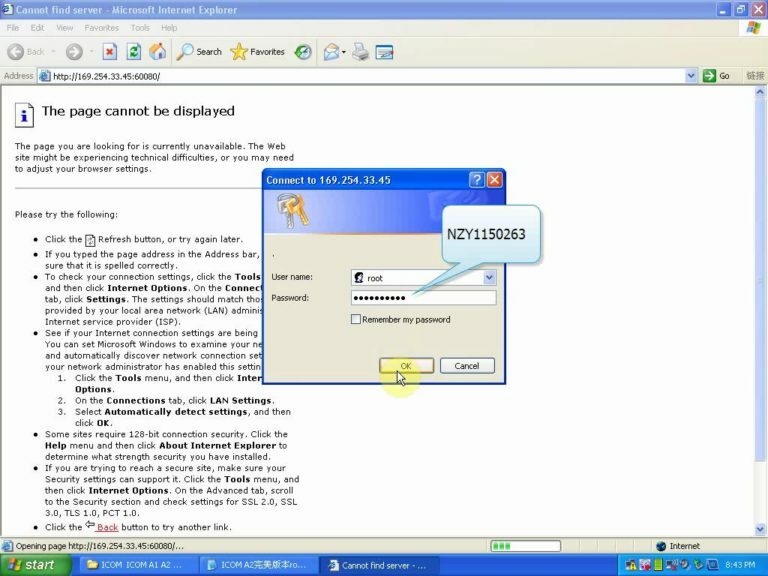 20.After the coding has ended, you can exit out of NCS Expert. 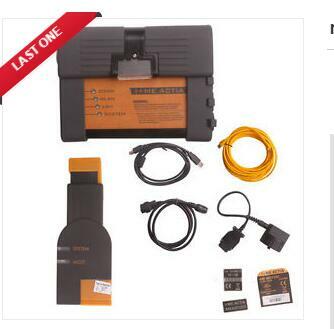 This is the solution I find when I have trouble in updating my car diagnostic scanner BMW ICOM A firmware. Hope this helps you also. I’m trying to update my ICOM firmware but I can only update the System/Boot firmware. Every time I try to update the Application firmware, I get a server timeout, no matter which browser I use. 4). Click “Update Firmware”,and you can find the version of firmware. click “Send the file”,the file is big so it will take some minutes to finish have patience. 10). When it is ok, click “reboot”.